The Lowcountry culinary scene has become known for the great chefs that define it with their innovative cuisine. 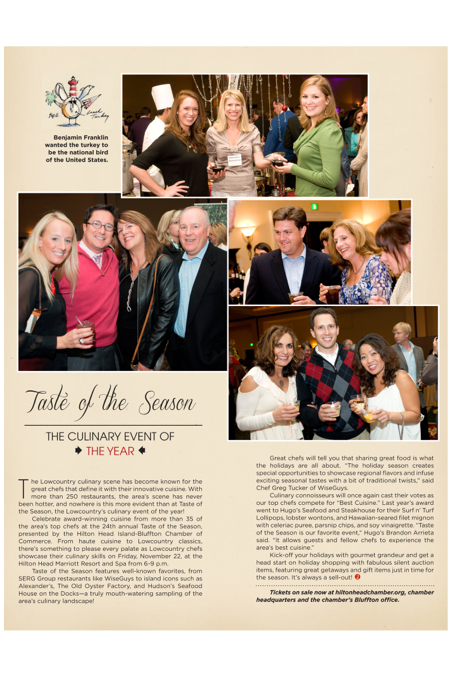 With more than 250 restaurants, the area’s scene has never been hotter, and nowhere is this more evident than at Taste of the Season, the Lowcountry’s culinary event of the year! Celebrate award-winning cuisine from more than 35 of the area’s top chefs at the 24th annual Taste of the Season, presented by the Hilton Head Island-Bluffton Chamber of Commerce. From haute cuisine to Lowcountry classics, there’s something to please every palate as Lowcountry chefs showcase their culinary skills on Friday, November 22, at the Hilton Head Marriott Resort and Spa from 6-9 p.m. Taste of the Season features well-known favorites, from SERG Group restaurants like WiseGuys to island icons such as Alexander’s, The Old Oyster Factory, and Hudson’s Seafood House on the Docks—a truly mouth-watering sampling of the area’s culinary landscape! Great chefs will tell you that sharing great food is what the holidays are all about. “The holiday season creates special opportunities to showcase regional flavors and infuse exciting seasonal tastes with a bit of traditional twists,” said Chef Greg Tucker of WiseGuys. Kick-off your holidays with gourmet grandeur and get a head start on holiday shopping with fabulous silent auction items, featuring great getaways and gift items just in time for the season. It’s always a sell-out! Tickets on sale now at hiltonheadchamber.org, chamber headquarters and the chamber’s Bluffton office. I truly love getting this magazine every month.